In this video, the mother robin tries to teach her baby robin how to hunt for worms in the grass. 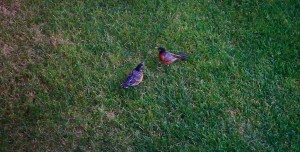 The baby follows right by the mothers side and watches as the mother robin digs in the grass for worms. The baby then gets the benefit of eating a mouthful of worms that the mother robin stuffs in its mouth. Watch more videos and view my photography!